Our garden designer surveys your garden, discusses your requirements and then works in liaison with yourself to achieve a final result that you will be delighted with. A full and comprehensively detailed plan will be drawn up together with a separate planting plan, and then they will be yours to keep. Once it has been decided what elements are required, such as a patio, path, lawn, vegetable garden, water feature, clothes line, shed, pergola, flower beds and borders, etc. 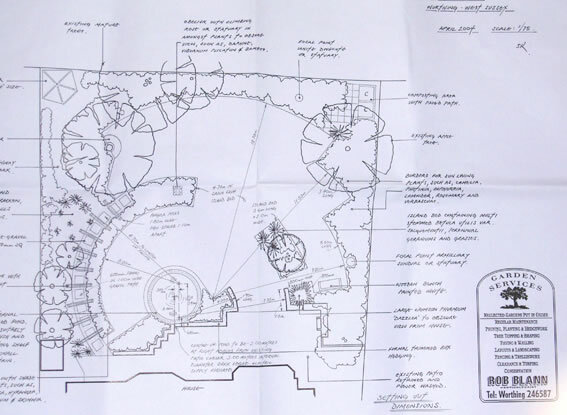 our garden designer introduces advice and inspiration to the process of designing the garden layout. 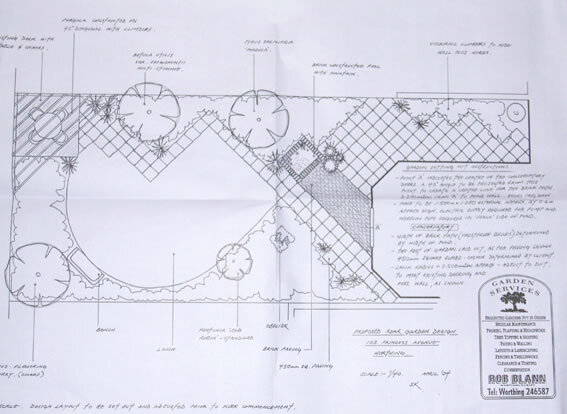 Then it comes to solving the various coordinating questions: such as what size and shape to create the patio area, where to position a water feature or path, and finally which plants would be most suitable? But this course of action alone will never provide the character of the garden. Rob Blann’s Garden Design Service has this special touch to create a style in keeping with the site, house and your own requirements, for our designer has a wonderful ability to turn an ordinary plain garden or even a problematical garden into a relaxing place with pleasing proportions and pleasant plants.